Home » Forums » Public Access » Chit Chat » Chuck Norris jokes are really popular now. Here's a few. Chuck Norris jokes are really popular now. Here's a few. Here's a few good jokes I've seen/heard. Enjoy! Some of those are pretty funny. Maybe I'll add them to the messages in the SWAT server. CN does'nt eat honey, he chews bees. CN gets Ravenshield and Swat servers for free. CN makes the Selection Course in 8 minutes. Once a Trp CN force SAS_CO_Random to leave the clan. CN scrolls the forum topics with his eyes. Walker are you sure most of them dont apply to me? really makes me happy :-). Here a "few" ... enjoy hehe. I always liked those commercials. Nah, he is Chuck Norris in [SAS] black kit! "His charm is so contagious, vaccines have been created for it." For lots of fun jokes and videos check Comedy Central's website. Chuck Norris was purty good in his prime and got some of his trainin from the Best as in Bruce Lee, He was a Very good brawler and could take a hit for sure. Sharks have a week dedicated to watching Chuck Norris films. If you flip China over, it says "Made by Chuck Norris" on the bottom. Siri is afraid to ask him questions. Chuck Norris beat Usain Bolt in a foot race while wearing flip-flops. 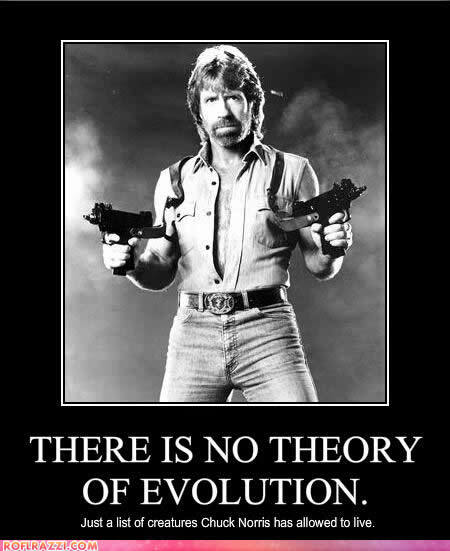 Everest is not a mountain, it's a tomb the Egyptians made for Chuck Norris. Chuck Norris has no hair on his testicles. Hair can't grow on steel. Chuck Norris won LeMans...driving a Prius. It takes Chuck Norris just one lick to get to the center of a Tootsie Pop. When Chuck Norris "goes Black" he CAN go back. After Chuck Norris visited the The Virgin Islands, they were known as "The Islands"
Chuck Norris eats soup...using chop sticks. Chuck Norris fought Superman. The loser had to wear his underwear on the outside. Chuck Norris was pulled over for speeding. He let the cop go with just a warning. Ghosts sit around the campfire and tell stories about Chuck Norris. Chuck Norris has touched MC Hammer. Chuck Norris made a paper airplane...it broke the sound barrier. Yoda learned the ways of The Force from Chuck Norris.